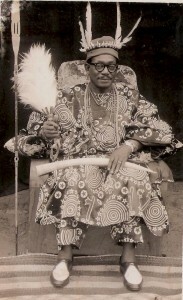 My grandfather circa 1955, Chief David Godson Okonmah, rocking some traditional attire-ness! There’s nothing better than finding an old picture of someone you love. It is the most advanced form of time travel we have, taking you back to moments you are nostalgic for – even moments you never witnessed yourself. I found a picture of my grandfather from 1955 in full on Nigerian Igbo traditional dress recently and it quickly became my facebook profile picture. There’s something satisfying about looking into those eyes that are at once your own and completely foreign. There’s an invisible line between both souls that is more than easy to cross, and with that ease comes some comfort and also some pain. Wu Tsang does a wonderful job of exploring this boundary in his dramatic short “You’re Dead to Me,” starring Harmony Santana of “Gun Hill Road” fame, and written by Adelina Anthony. Here a mother and her estranged child attempt to come together after years of animosity, but there is something in the way – a picture of her child in little league attire from years ago, stuck in time, precious. Laura Patalano turns in a great performance portraying the difficulty of a mother who needs to let go of that nostalgic image of her child, showing such anger at the person her child has manifested into, preserving old clothes and hats just for the sake of hanging on to that first image of the child she birthed. Any good parent realizes that being stuck in the past is a road block to developing a real relationship with your adult child, and in the end our mother does come to that realization, but it’s hard. Not only because she remembers the past, but because she has that picture and every moment she spends looking into it makes her feel like the past is right there, standing next to her – but for the most part, it is not. “You’re Dead to Me” is about trying to live in the present when the past has such a hold on you. It’s about a mother casting her expectations aside for the happiness of her child, and herself. When mother and child reconcile it’s clear to see, time traveling with nostalgic pictures is great – but nothing replaces the power of a good hug, right here, right now. Take a moment to watch this, and share it with your mom or someone you’ve known in the various iterations of yourself. And maybe find an old picture of the two of you to share, then and now, and take the time to appreciate how far you’ve come and how much you still see the old person in the new because a never-ending continuum connects us all one to the other. Don’t forget to cast your vote for “You’re Dead to Me” in the PBS Online FIlm Festival. This short was produced in collaboration with National Minority Consortia (with special support from Latino Public Broadcasting), Film Independent’s Project Involve, directed by Wu Tsang, written by Adelina Anthony and produced by Melissa Haizlip. Previous StoryLook in the Mirror, Do You See an American?